Donald’s inaugural 2011 Poster Calendars rank high on Amazon. Which Mr Verger owns and loves. You can also enjoy the growing comments describing the calendars. And help spread the word. And please stay tuned to it’s announcement. After a while of tossing around the idea, and a few weeks of struggling with the final decisions, Donald Verger has a new calendar hot off the press! Inspired by various poster calendars, including those by Linnea Design, Dana Heacock, and Kate Libby, Donald Verger decided that a poster calendar would be a great way to make his photography serve a function, while still being a beautiful piece of art. We began our process by choosing the best images to suit the design. There were plenty of brilliant images to choose from, and the only problem was, there were so many we wanted to include! Ultimately we gathered together the opinions of friends, family, strangers, professionals, and a few enthusiastic Starbucks employees, in order to choose the final twelve. The final week or two of design was an incredible amount of work. For a product that appears so fresh and simple, there are a lot of details that need to be taken into account. Hours were spent debating issues such as the size of the font, whether or not we should have borders, the weight of the paper, the packaging, and so much more! It’s much easier said than done. 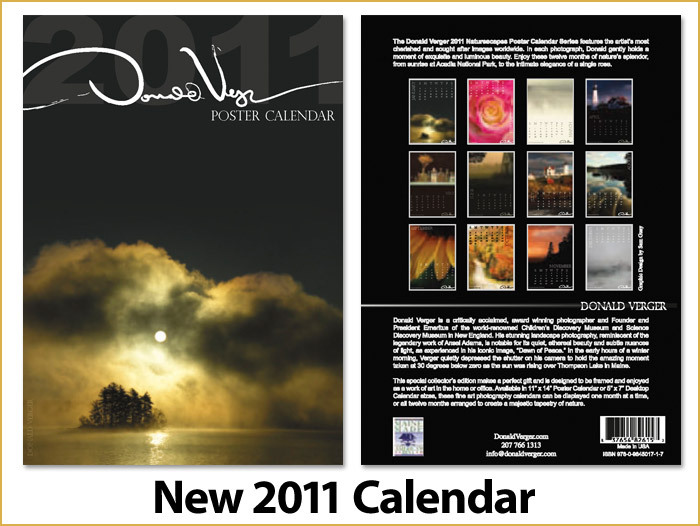 Choosing the final details of the cover were also difficult, but ultimately we chose Verger’s signature image Dawn of Peace to represent the very first of the collectible poster calendars. We also decided on using Verger’s actual signature on the cover as our special touch. The final creation consists of twelve striking images that range from bold lighthouses, to brilliant blossoms, fall foliage, and much more. The dates are subtly placed over the image, so as not to take away from the photograph. They also fit a standard 11×14 frame and can be hung individually or all together. Watch for updates! More to come… but for now take a look at the calendar! Special thanks to the folks at Linnea Design and Annie Catherine who were a huge help in this process! Following the reconstruction of The Portland Press Herald’s website, the article previously know as “Selling art that will set people free” has been retitled. It was originally released on March 5, 2009. Please read the article, at the new link, HERE. You may have heard of the Lighthouse Depot up in Maine, a prestigious gift shop sporting the largest variety of lighthouse gifts and high-quality merchandise from all around the globe. And now, Donald Verger, is honored to be selling some of his art in this store. Lighthouses are such a strong, solid, symbol of coastal history and many people love that beauty and symbolism these guardians offer. Often, families and enthusiasts will plan vacations to visit several lighthouses, or just a favorite one which they visit regularly. In 1992, this group began a monthly publication of Lighthouse Digest with 34 paid subscribers, and shortly after, opened their store in Wells. The store has grown over time, two whole floors full of lighthouse gifts, representing many states and 20 countries. And better still… a percentage of all sales goes to various lighthouse preservation groups around the country. Their website offers hundreds of lighthouse tales, an online catalog, as well as links to other lighthouse sites. Lighthouse lovers can’t miss this! For a link to Donald Verger’s work available through the Lighthouse Depot see, click here. Join Donald Verger and many other artists for the First Friday Art Walk in Portland, Maine. The First Friday Art Walk is a self guided tour through art studios, galleries, museums, and alternative art venues. The event is held on the first Friday of each month from 5-8 pm. OUR MISSION is to open the doors of Portland’s visual arts community by joining together and introducing a wider audience to the unique vitality of the artists and venues of Portland. Promoting interest with non-exclusivity and easy access, thereby strengthening the arts and community through diversity and celebration. Donald Verger’s work will be on display during the First Friday Art Walk, as well as all month long in Artist & Craftsman Supplies. M-F 8am-7:30pm, Sat 9am-7:30pm, Sun 10am-6pm. Venue Description: Artist and Craftsman Supply offers quality discount art supplies, for professionals, students, children, and crafters since 1985. Hope to see you at this exciting event!